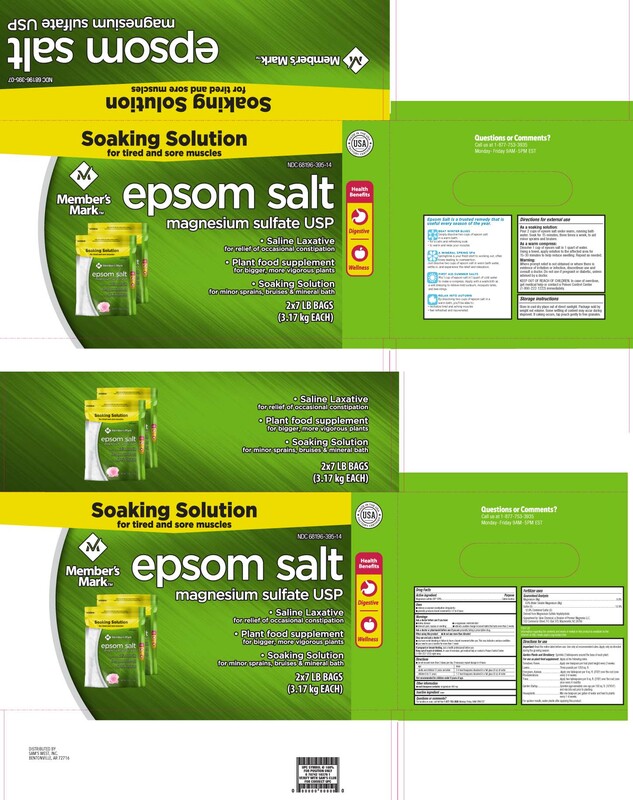 Proprietary Name: Epsom Salt What is the Proprietary Name? Non-Proprietary Name: Magnesium Sulfate What is the Non-Proprietary Name? Epsom Salt with NDC 68196-395 is a a human over the counter drug product labeled by Sam's West, Inc. The generic name of Epsom Salt is magnesium sulfate. The product's dosage form is granule and is administered via oral; topical form. Dosage Form: Granule - A small particle or grain. Do not exceed more than 2 doses per day; if necessary repeat dosage in 4 hoursagedose adults and children 12 years and older 2-4 level teaspoons dissolved in a full glass (8oz) of water children 6 to 11 years1-2 level teaspoons in a full glass (8oz) of waterNot recommended for children under 6 years of age.